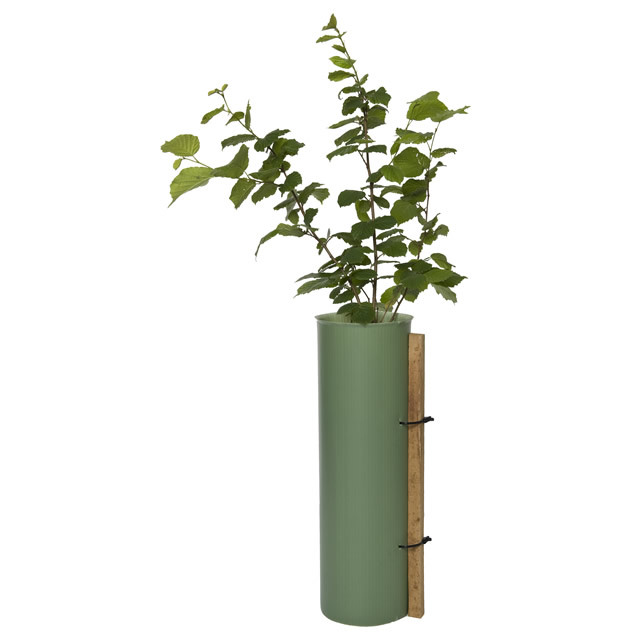 When growing shrubs, it is important to allow for lots of lateral branch growth for a natural look and this is what the Tubex Shrubshelter is designed for. The wide diameter Shrubshelter and extra wide diameter Shrubshelter Plus will provide protection against hares, rabbits and voles as well as providing complete herbicide protection. Choose 60cm for rabbits and 75cm for hares and secure with a stake. The Tubex Shrubshelter is a solid wall shelter manufactured in the UK by Tubex, the UK's leading designer of tree protection products. As an Official Tubex Distributor Alba Trees Forest Nursery is pleased to offer our customers the full Tubex product range, delivered throughout the UK along with our quality, cell grown trees and shrubs. Made from the same material as the Standard Shelters and so transmits light to the shrub for strong, uniform growth. Wide diameter for lateral shrubby growth. Shrubshelter plus is extra wide diameter. Branches do not become entangled so shelter is easy to remove. When installing the Shrubshelter, ensure that the flared rim is at the top, which prevents rubbing of the shrub. Insert your stake 1/3 into the ground with the top of the stake below the top of the Shrubshelter. Push the shelter slightly into the ground for a firm seal. Shelter has ties pre-fitted for securing to the stake. Although the Tubex products are designed to naturally break down over a number of years, it is best if the Shrubshelters are removed after the shrubs are fully established so that they can mature naturally. Tubex products are designed to help during the establishment phase for trees, hedging and shrubs.